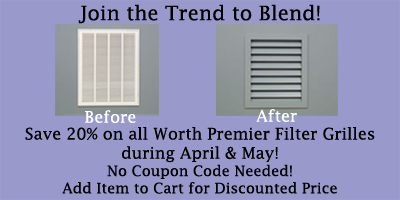 Save 20% on all sizes of Worth Premier Wood Filter Grilles during April and May. No coupon code needed! Discount is automatically applied when the item is added to the cart. Take advantage of our "FREE SHIPPING" on ANY order over $100 and stock up on registers for your entire home! There is NO coupon code you need to remember, because this free shipping discount automatically applies in your cart. No coupon code needed! Free shipping automatically applied on all orders with subtotal over $100. *Free Shipping offer good only with shipping addresses in the continental US. **This promotion has ended (coupon expired).Please check back often for more sales and coupon code events! Save 5% on qualifying floor registers. Look for this umbrella image to signify qualifying floor registers, or see full list below. **Please Note: This 5% coupon code can only be used on the qualifying floor registers. The discount will not be applied to any non-qualifying items in your cart. This coupon code cannot be used in conjunction with any other discount code or promotion. Coupon Code Expires April 30.